In order to structure the diverse research topics relevant for INSPIRATION, we have discussed a Conceptual Model. As stated in Wikipedia, a conceptual modeling is the activity of formally describing some aspects of the physical and social world around us for the purposes of understanding and communication. A conceptual model's primary objective is to convey the fundamental principles and basic functionality of the system which it represents. INSPIRATION´s aim is to identify future research needs and to develop a Strategic Research Agenda (SRA) towards sustainable soil and land management including the soil-sediment-water (SSW) system. Sustainable land management seeks to balance the demand and supply of resources and our natural capital, to cope with the effects of several driving forces and to decrease the global footprint of human made production and consumption activities. Thereby the main EU-societal-challenges which are expressed in the Horizon 2020 work programmes will be met. In order to identify cross-country and cross-sectoral knowledge gaps, research questions are structured along four overarching perspectives within a conceptual model (see figure). Land and the SSW system are goods and natural capital stocks that have to be used in a way that maximises the non-depleting use of ecosystem services. However, there are manifold drivers which affect natural resources, their potentials and as well as their use, and which may eventually lead to a degradation of whole ecosystems. , intensive and unsustainable land use may have significant impacts to ecosystems and their ecological functions. Additionally, ecosystems are affected by natural drivers like extreme climate events in particular due to climate change (floodings, dry periods, etc.). Principally, there are conflicting interests regarding land use among the relevant stakeholders in a society (farmers, land planners, citizens, etc. ), e.g. regarding loosing productive areas, increasing productivity and/or protecting natural resources. As a rule both are following mainstreams of a paradigm of ‘Either-Or’: expectations of land-users towards maximizing economic benefits of natural resources stocks and goods on the one hand, and maximum requirements from societal groups towards different protective regulations on the other. Thus the management of agricultural, forest and urban land resources as well as the conservation of biological diversity or natural capital in a sustainable way has to follow integrated, cross-sectoral concepts in order to answer the different demands of stakeholders. And finally, the economic, societal, administrative and political impacts which are steering and governing land use “sensu lato” including stocks and goods of natural resources have to be considered. Thus the net-impacts on a local, regional and global as well as temporal scale are significant back-coupling drivers and determinants of crucial importance. These challenges must be tackled to benefit from the land & SSW system and to avoid depletion of our natural capital and resources. Better land use and land management are the means to that end. Multi-dimensional and intra-disciplinary approaches to research have been very successful in building our present understanding of ecosystems with their services and to protect natural resources. The challenges we face inherently straddle disciplinary boundaries and changes in one domain can have unwelcome and unforeseen consequences in another. Demand: What does society demand from natural capital and ecosystem services including the SSW-system? Natural capital: What has nature, including the SSW-system to offer and which determinants sustain the system? 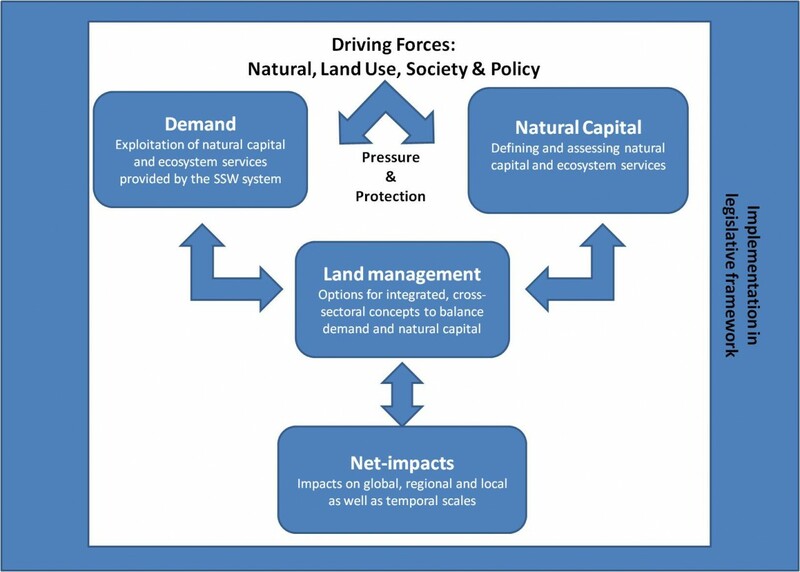 Land management: What are options for an integrated, cross-sectoral land management to balance societal demands and natural capital? Net impacts: What are the impacts of different options of managing natural capital, including the SSW-system on global, regional and local as well as temporal scales?